Ferrari 375 MM Pinin Farina Berlinetta Speciale s/n 0456AM "Bergman Coupe"
The Ferrari 375 MM was related to the F1 single seater, like the GT version the 375 America. The engine was based on the F1 powerplant, there were two engine types tipo 108 for customer cars and tipo 102 for factory cars. 0318AM started life as a 340 MM Pinin Farina Berlinetta raced by the Scuderia Ferrari, already before teh 24h Le mans race it's engine was upgraded to 375 MM specs, nevertheless after 10 hours the race was for Ascari and Villoresi over. 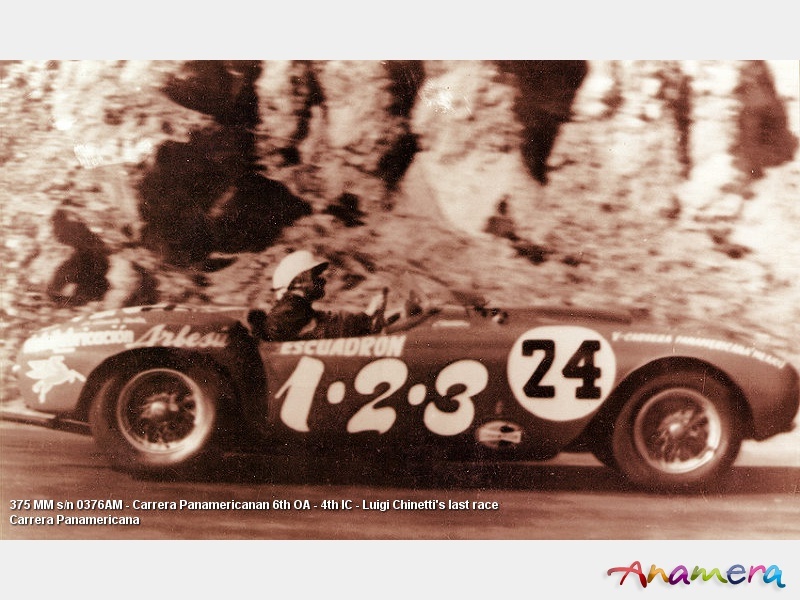 In the Carrera Panamericana both Stagnoli and Scotuzzi were killed in an accident after a tire had blown up. 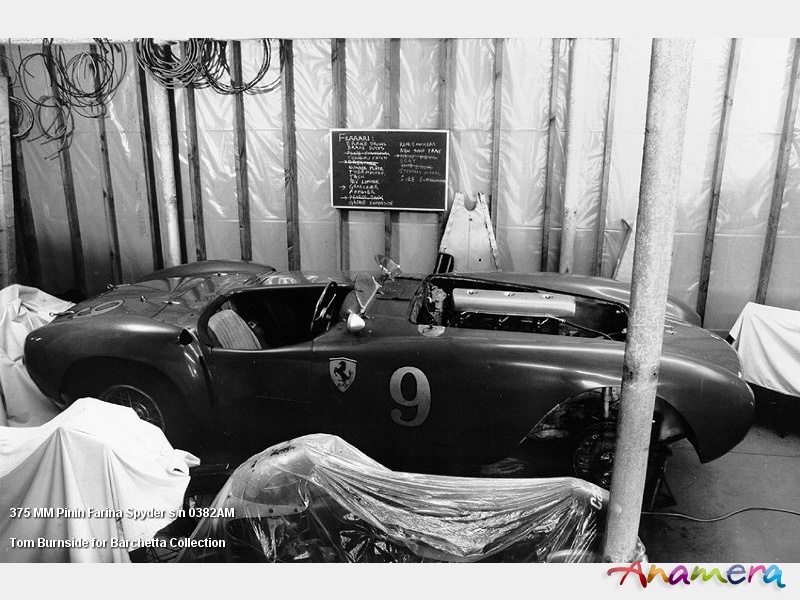 0320AM started life as 340 MM Pinin Farina Berlinetta and was a factory Team Car raced by The Scuderia Ferrari. When raced in the Le Mans is still had a 340 power plant. Mike Hawthorn and Giuseppe Farina were disqualified, coming in 10 laps to early to add brake fluid. 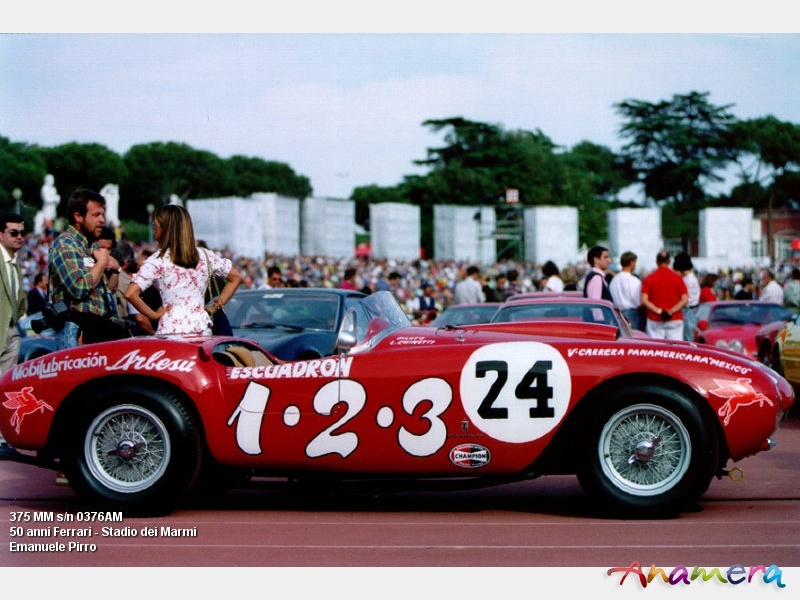 In 1953 0320AM raced in 24h Spa (dnf), Senigallia (dnf), 12h Pescara (1st), driven by variuos driver pairing ofAlberto Ascari, Luigi Villoresi, Mike Hawthorn, Umberto Maglioli. 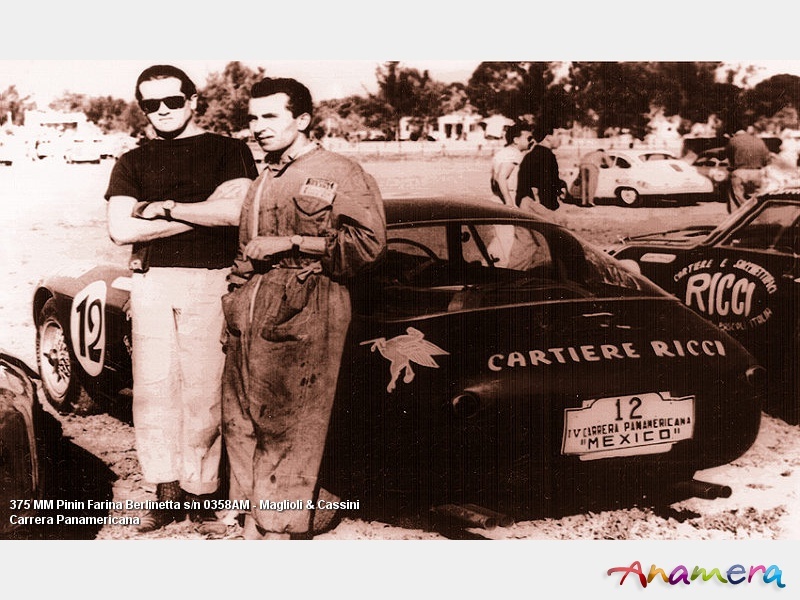 Marco Ricci, Forese Salvati and Umberto Maglioli finished 6th OA in the Carrera Panamericana, Maglioli won on the Circuit of Guadeloupe. Now the section with the real 375 MM's starts. 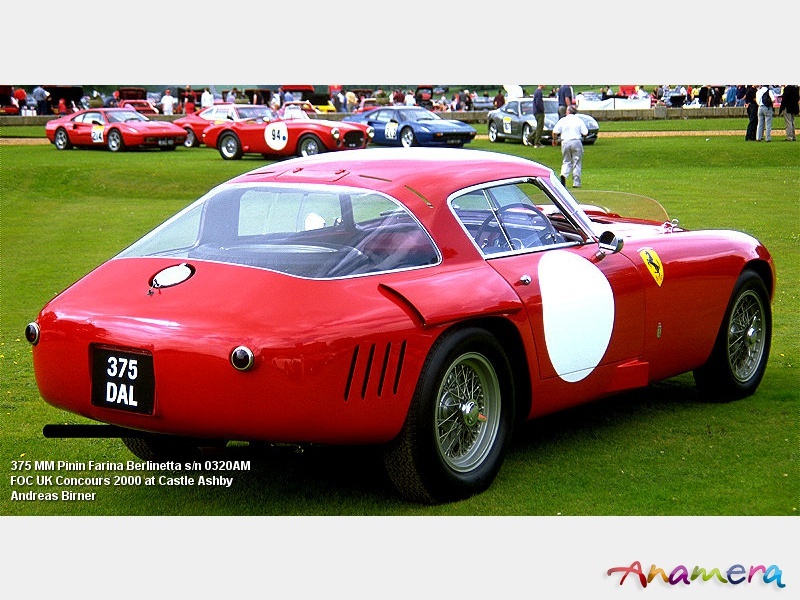 0358AM started as Pinin Farina Berlinetta, it was sold to Franco Cornacchia, Scuderia Guastalla, Milano, Italy. In November 1953 it participated in the Carrera Panamericana, in the cockpit Umberto Maglioli and Nino Cassini, it was retired after it lost a wheel, immediately after the race 0358AM was sold to Argentinian Carlo Bonomi. 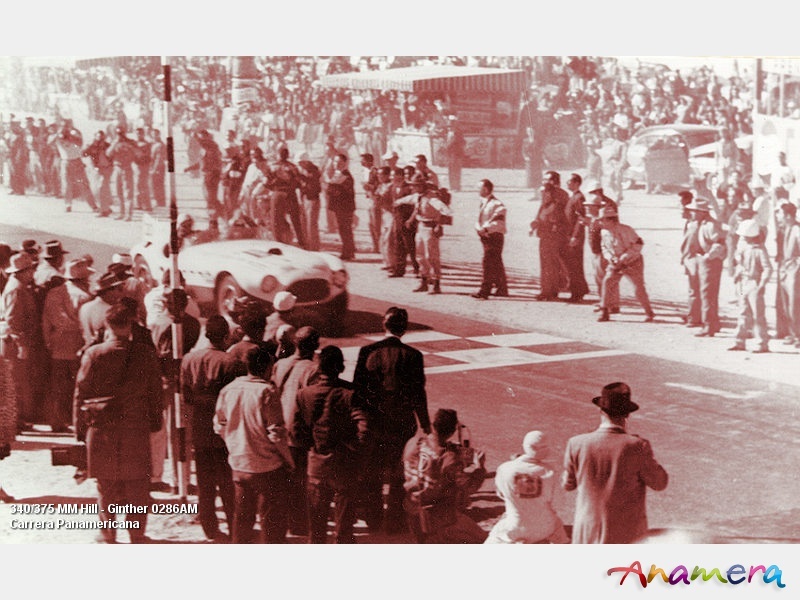 Bonomi entered the 375 MM again in the Carrera Panamericana and retired for unkown reason on the 1st stage. A couple of month later Carlo Bonomi and Castro Cranwell raced the Berlinetta in a new painted scheme - looks for every race it had a nes one - in th 1000km Buenos Aires race, it did not finish, the same in the 2 following years. In 1988 Bob Des Maries was looking for an engine. 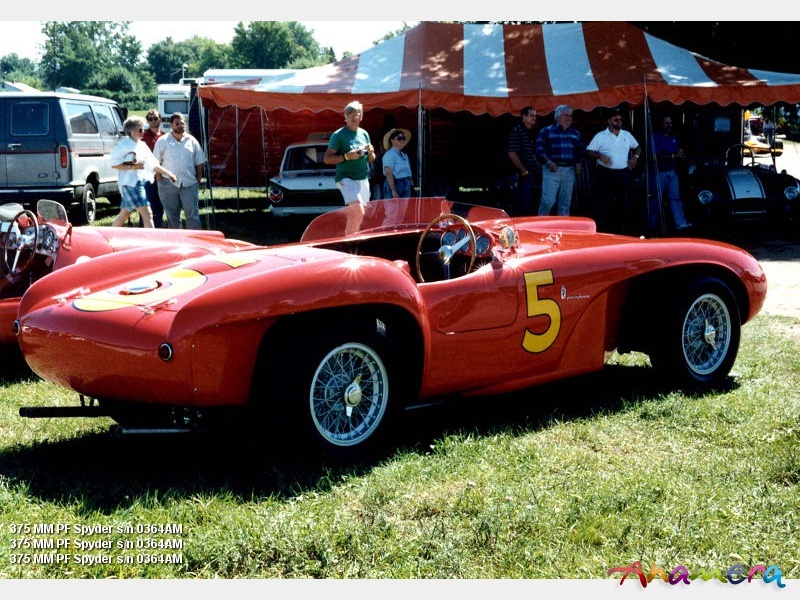 0360AM was the 1st 375 MM Pinin Farina Spyder, it was sold to Piero Scotti, Firenze, Italy. 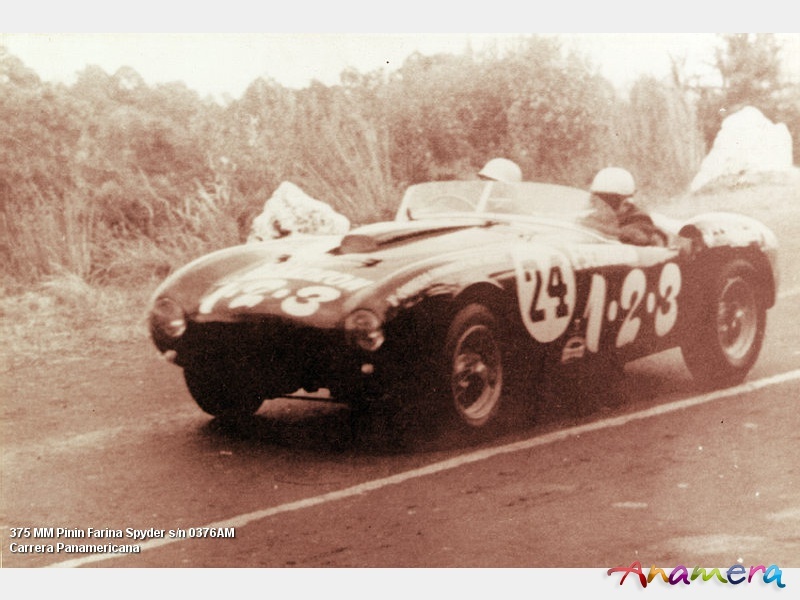 In December 1953 Scotti won in a 375 MM Spyder the 12h of Casablanca. 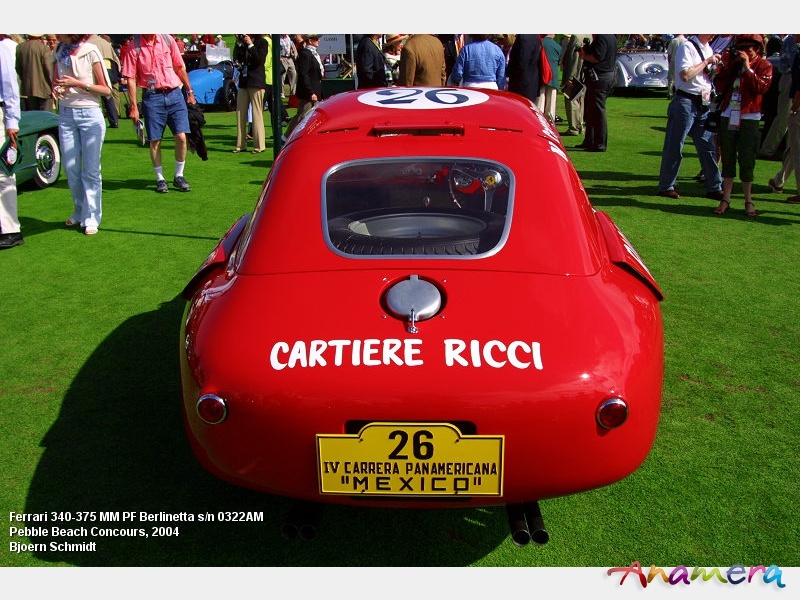 From now expierenced racer Scotti, drove 0360AM until 1955 and finished mostly all races with a podium position. 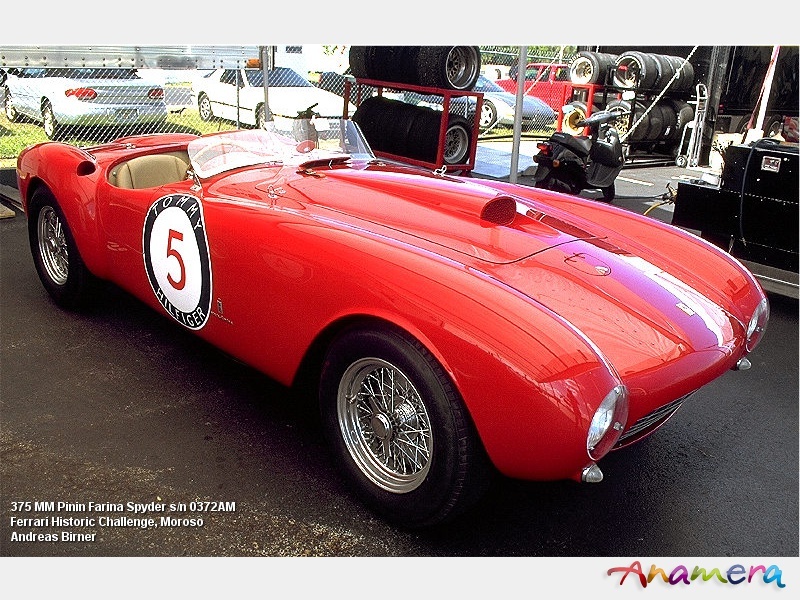 0362AM was a 375 MM Pini Farina Spyder and was delivered to Los Angeles for Tony Parravano. It won with McAffe the Golden Gaze Park race, the Offbut AFB race and in the hands of Chris Drake it won the Palm Springs race. 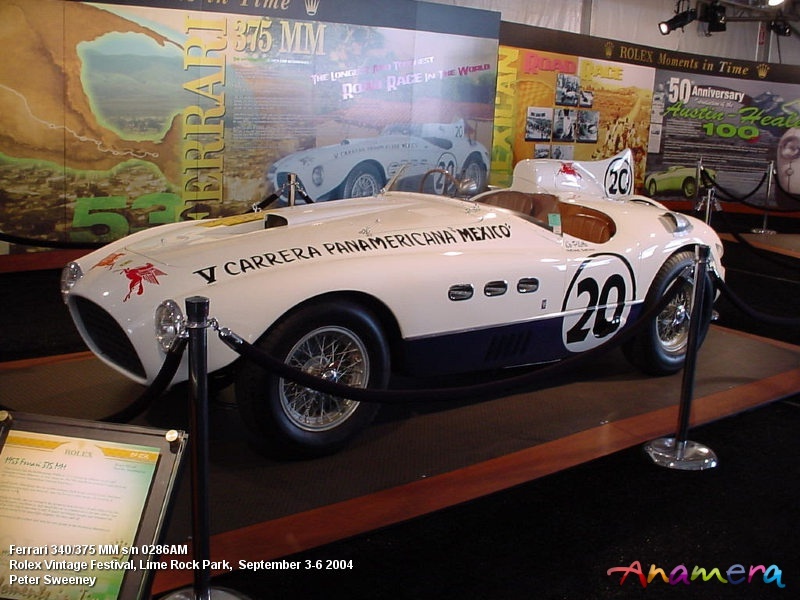 In the 1955 12h Sebring race the rear and caught fire, later the year McAfee flipped the 375 over in the Bakersfield race, after this incident the chassis was shortend a new platic body fitted and a 4.2 litre Maserati engine installed, Dan Gurney and Skip Hudson raced this car. 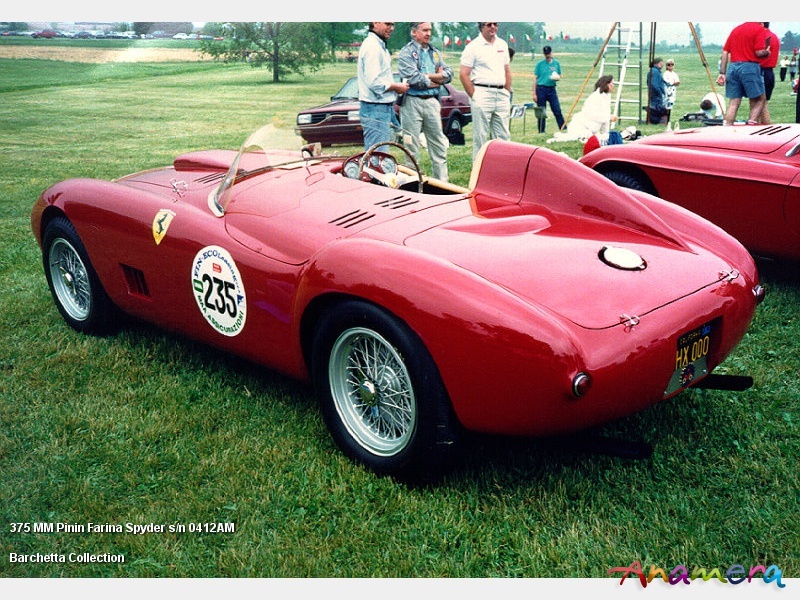 0364AM was a 375 MM Pinin Farina Spyder delivered to Jim Kimberly, it's body work was different to all other 375's, it enhanced the cooling of the brakes, but did not contribute much to it's looks. In 1954 Jim Kimberly was America's No. 1 Sports Car Driver and won 17 out 20 races. It continued racing in the hands of Rich Lyeth until late 1959. 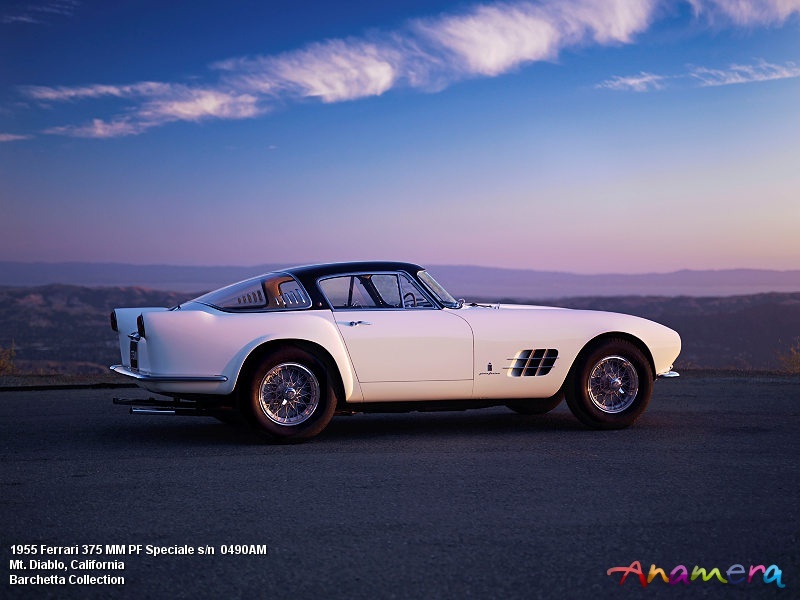 0366AM was a 375 MM Pinin Farina Spyder delivered to Portugal for Casimiro de Oliveira. It was raced in the 12h of Casablanca (acc), won the 9h Hedemora GP in Sweden, finished 7th in the GP of Sweden, did not finish in the GP Porto and teh GP of Portugal and had an accident in the Skarpnaeck Airfield. It was sent back to the factory and rebodied by Scagilietti, from now on it was raced in Sweden, damaged in a fire, repaired in Italy and then back to Sweden. 0368AM was 375 MM Pinin Farina Berlinetta, in Max Meyer light gray 015702, delivered to SEFAC Director Michel Paul-Cavallier. Was sold to the USA in the 1970's it came back to Europe and is part of the Bardinon Collection, it is displayed at Mas du Clos, looks stunning in metallic dark blue. 0370AM was a 375 MM Pinin Farina Spyder when it left the factory, in January 1954 it won the 1000km Argentia race with Giuseppe Farina and Umberto Maglioli, this was a Scuderua Ferrari entry. Then the car was sold to Masten Gregory after it was crahed in Pebble Beach in practice it was send back to the factory for repair. In the 2nd half of 1954 Masten Gregory won many races in Europe and the USA. This victory series continued with Dale Duncan, at this time Masten Gregory's brother-in-law. 0370AM continued raacing until the early 60's. At a certain time the engine was removed from the car and for long time with 0382AM as a spare, but in the late 90' it was re-united with 0370AM. 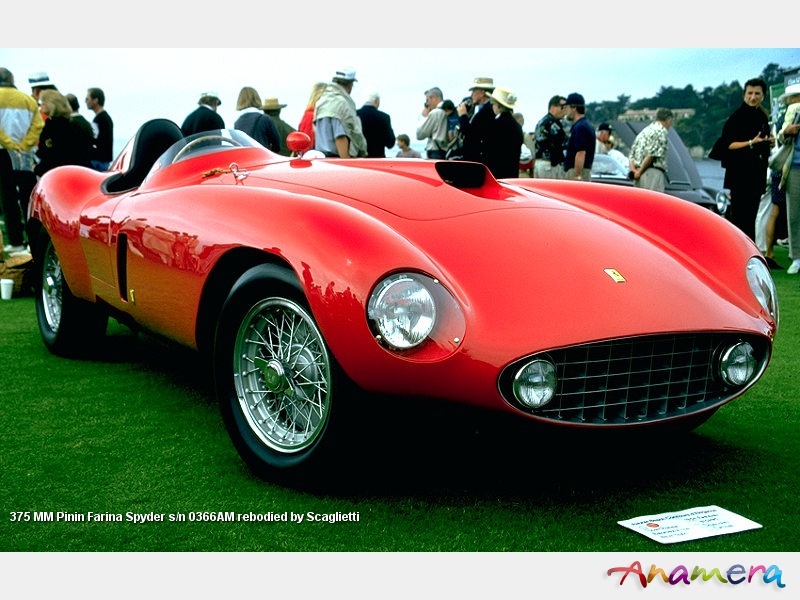 0372AM was a 375 MM Pinin Farina Spyder when it left the factory, sold to Briggs Cunningham. It was raced by John Fitch and Phil Walters in 12h Sebring (dnf), for 24h Le Mans race the car was heavily modified to cure the brake cooling problems but it did not finish either. Briggs Cunningham finished 6th in Watkins Glen. Already a month later Sherwood Johnston the new owner placed the car in victory lane, 0372AM was campaigned in many US races with success. 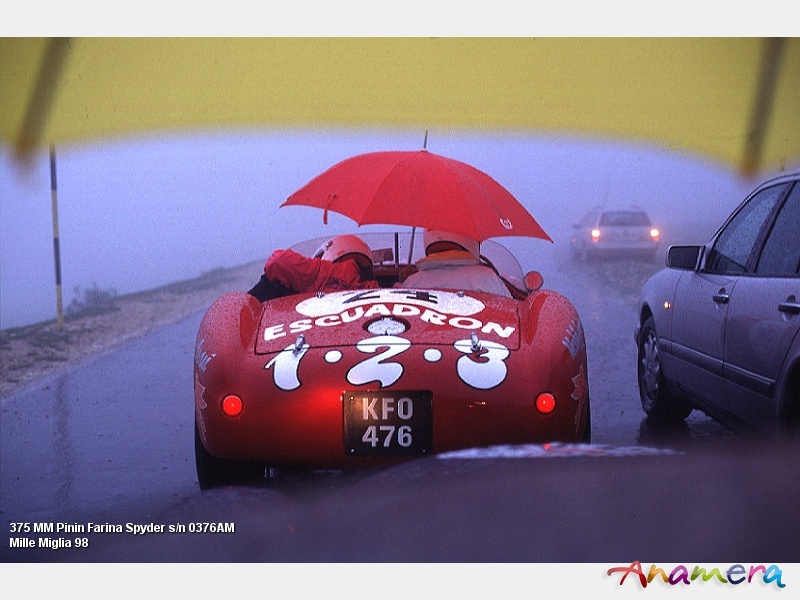 0374AM was a 375 MM Pinin Farina Spyder when it left the factory, it was sold to Jose Maria Ibanez in Argentia. It was raced with success, but also crashed several times, it race career came to an end when hitting a tree. 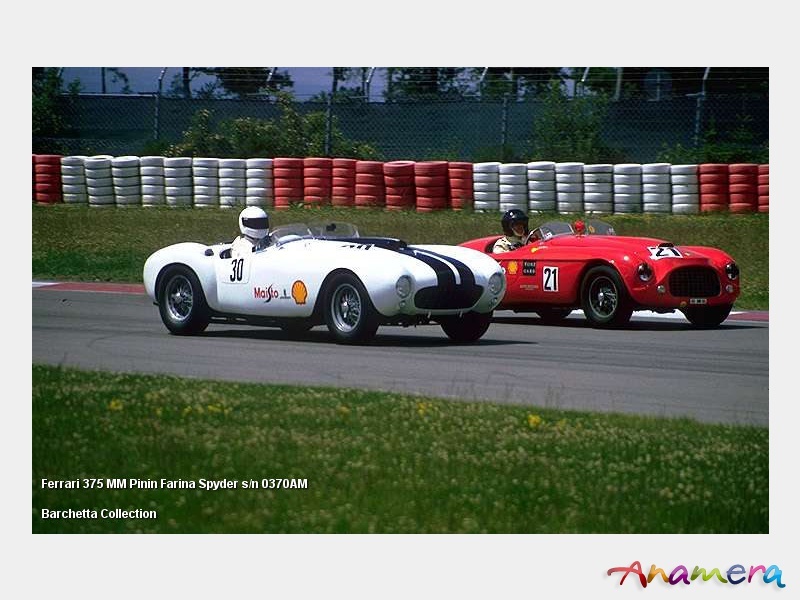 0376AM was a 375 MM Pinin Farina Spyder when it left the factory, it was sold to erwin Goldschmidt. He won 2 races and replaced with a 375 Plus which Umberto Maglioli drove in the Carrera Panamericana to an outright win. Chinetti displayed 0376AM at the New York Auto Show to John Shakespeare. 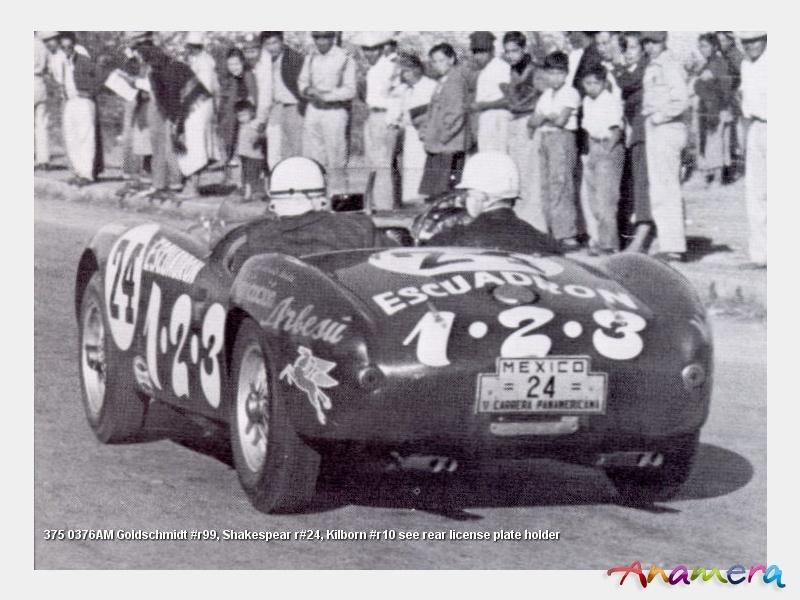 Both particpated in the 1954 Carrera Panamericana and finished 6th OA and 4th IC. Luigi Chinetti active race career ended after this race. John Shakespear and John Kilborn raced it until the early 60's. Kilborn and Howard Hively won in 1956 the 6h Road America race in Elkhart Lake. 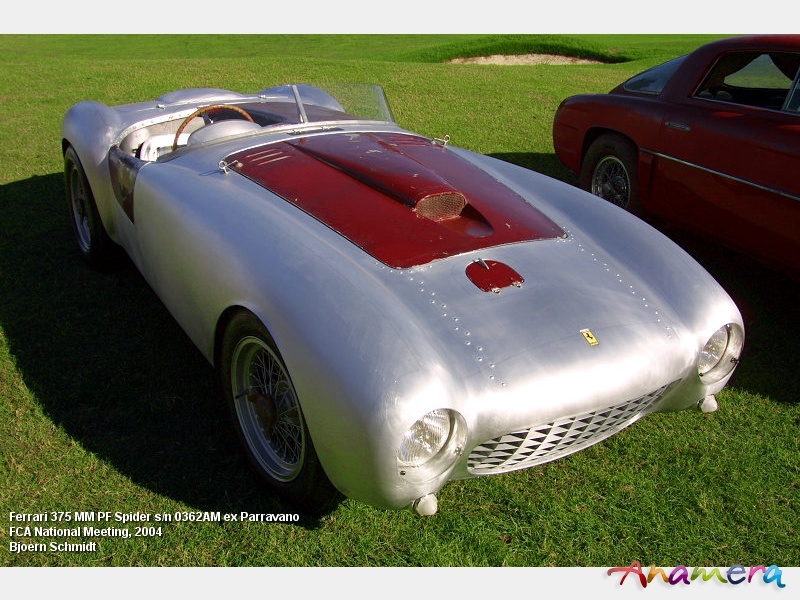 0378AM was a 375 MM Pinin Farina Berlinetta when it left the factroy and was supplied to Max Wax Vitale in Genoa, Italy. 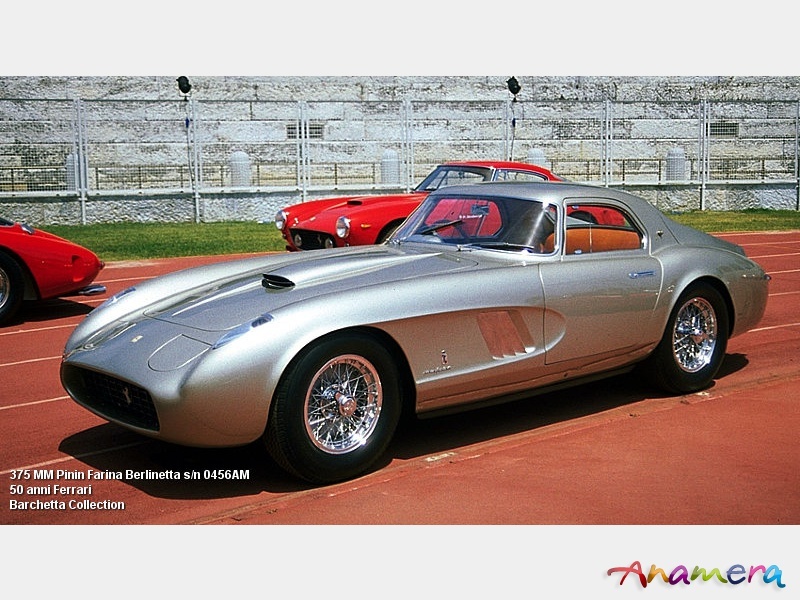 0380AM was a 375 MM Pinin Farina Berlinetta when it left the factory and was Genoa Show car. 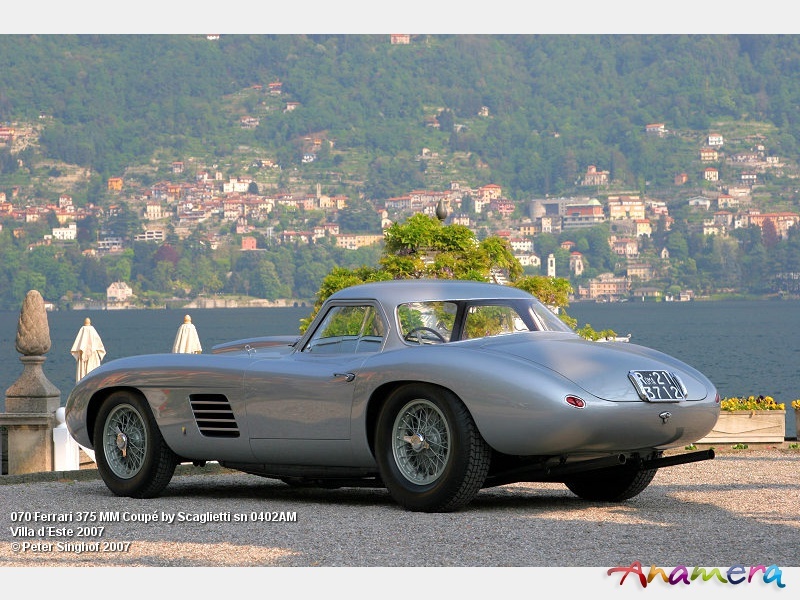 Conte Innocente Baggio was the 1st owner it was raced in the Mille Miglia and in teh 24h Le Mans race. In 1960 it has been spotted in a spectators parking lot. In 1996 it was owned by Roger Wheeler, Huntington Beach. 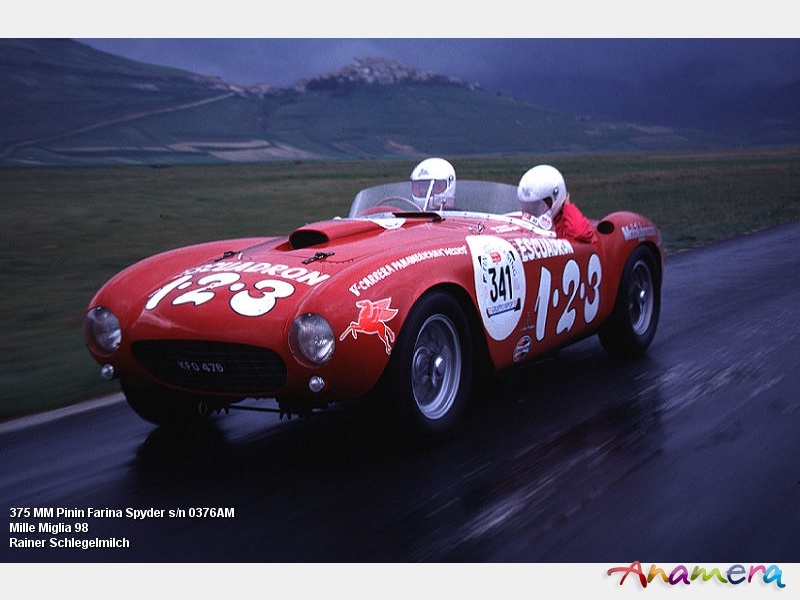 0382AM was a 375 MM Pinin Farina Spyder when it left the factory. The 1st ownwer took delivery in 1954. Bill Spear won several races before it was passed on to Duncan Black, he raced the car until 1958 with success. 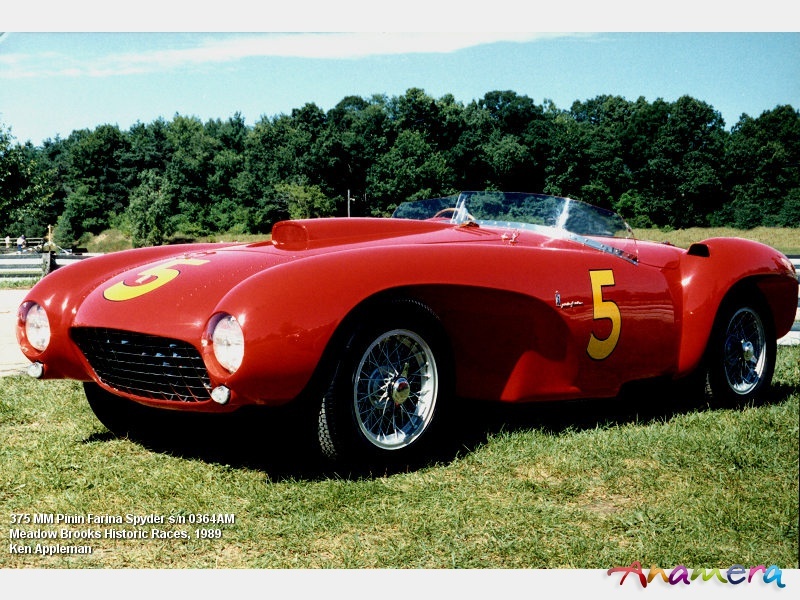 0402AM was a 375 MM Pinin Farina Spyder when it left the factory and was sold to Roberto Rossellini, he drove the car to Sweden. Later the car was rebodied by Scaglietti as a Coupe. 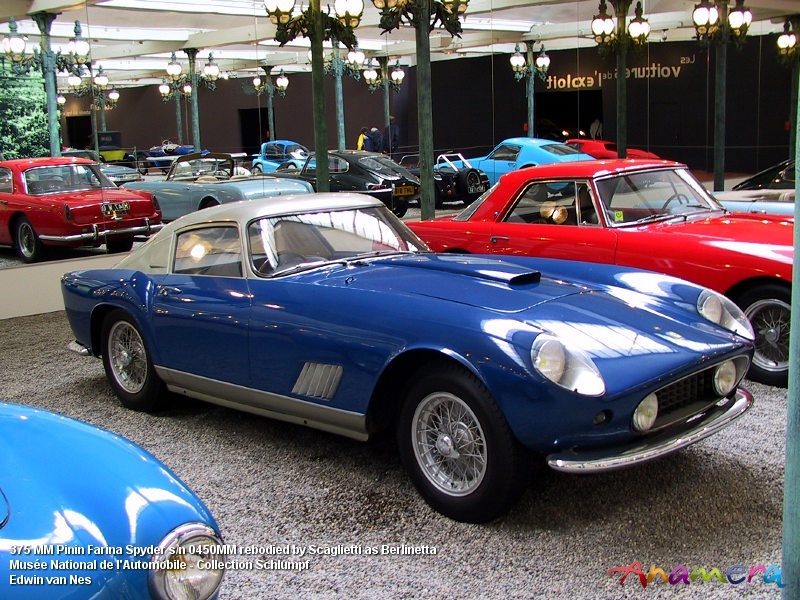 0412AM was a 375 MM Pinin Farina Spyder sold to Piero Palmieri of Rome, when it was sold to actor William Holden it featured a headrest. 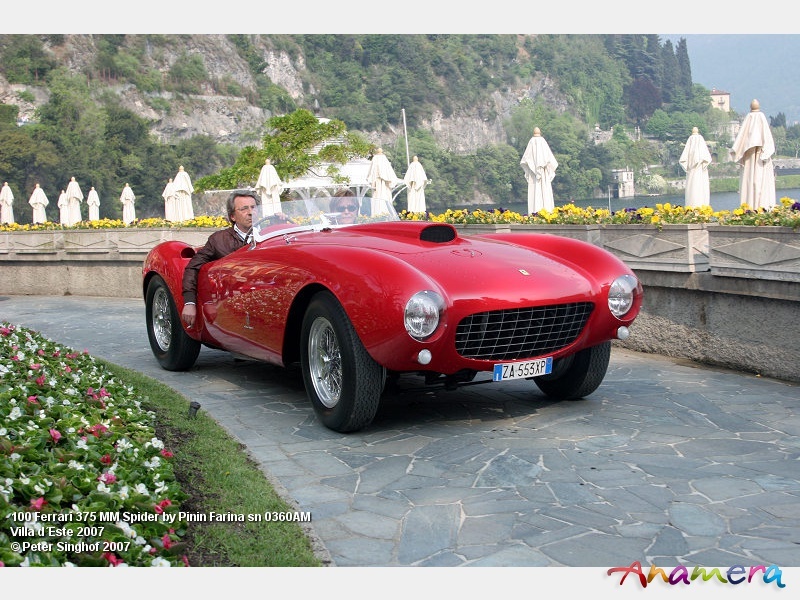 0416AM was a 375 MM Pinin Farina Berlinetta and was sold to Tommaso Sebastiani, Rome, it appered in the movie La Fortuna di Essere Donna" starring Sophia Loren and Marcello Mastroianni. 0450AM was a 375 MM Pinin Farina Spyder and sold to Kaiser Bao Dai, later it was rebodied by Scaglietti as Berlinetta with a TdF style body. 0456AM was a 375 MM Pinin Farina Speciale Coupe also referred to as the Bergman Coupe, the Ferrari order books state it was for Roberto Rosselini for his wife Ingrid Bergman, apperntly she never took delivery. The Pinin Farina drawings state it was the "styling study" ten years later used for the 275 GTB. 0460AM was ordered by Williamine Day, it was a yellow 375 MM Pinin Farina Spyder with green interior, still with the same family in Nevada. 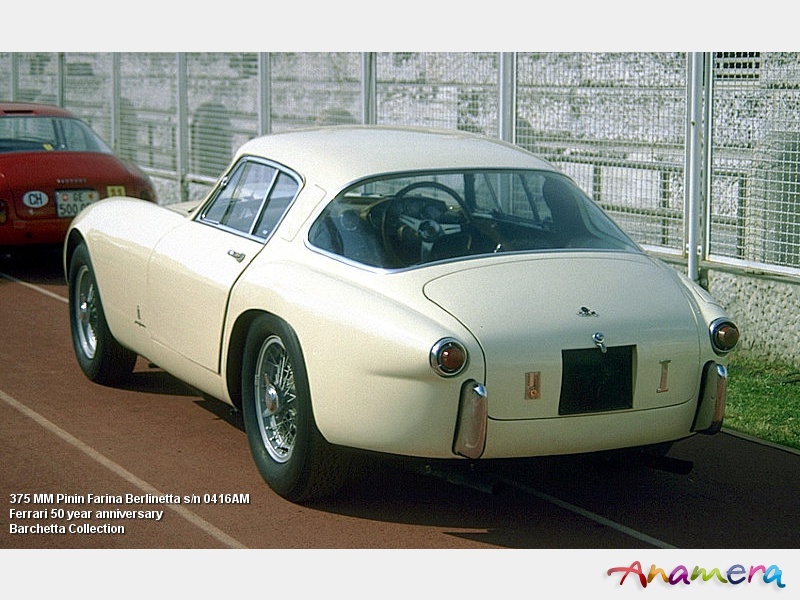 0472AM was ordered by Alfred Ducato a California resident it left the factory as 375 MM Pinin Farina Berlinetta. 0490AM was a 375 MM Pinin Farina Berlinetta Speciale it was the 1955 Torino Show car.